The following is a guest post from Andy Thayer and Christine Geovanis, who are both working with the Coalition Against NATO/G8 (CANG8). The post is on Chicago Mayor Rahm Emanuel’s new protest ordinances, which The Dissenter has covered, and were passed in “preparation” for the NATO/G8 meetings that will be taking place in May. Their perspectives are being featured here because they are both influential and hard-working activists in Chicago, who understand how these new ordinances will impact Chicago. These two individuals are also willing to keep on fighting Emanuel no matter what he tries to do to get in the way of people’s rights to assemble and engage in freedom of speech and that really comes through in this post. The post originally appeared at Chicago Indymedia and has been republished with permission. To help folks separate spin from fact, we’ve put together this analysis to help you understand how local rules have changed in ways that undercut protest and political speech. While these revisions will not deter us from speaking out and protesting, they do change the excuses the police may use to try to prevent us from protesting. It’s also important that we understand these changes so we can educate our friends and neighbors – and fight for meaningful change that puts people’s rights and the greater good ahead of the fear-mongering and greed that drove Mayor 1%’s push for these changes. City Hall made only token changes to “improve” these revisions, and the worst of Mayor 1%’s proposed revisions remain. While the old protest ordinance was pretty terrible in its own right, the changes approved this week make it even worse. How? Because the revisions give the police more excuses to target protesters they don’t like and speech they oppose with greater fines and penalties. The revisions also give police more excuses to try and censor the tools we use to speak out – sound equipment, signs, banners and whatnot. Let’s be clear, under the old ordinance, police routinely repressed speech they disliked anyway. More than a few protesters have been arrested for absolutely no reason, only to find that the police have cooked bogus charges as an afterthought – and an excuse for targeting them in the first place. But few aldermen or reporters understand the problems with the OLD ordinance, and they certainly have no experience with the police department’s chronic selective enforcement of the rules. Most have taken Mayor 1% at his word on the impact of these changes – setting them up for serious buyers’ remorse once City Hall starts using these changes as an excuse to suppress political speech. It’s also important to note that Mayor 1%’s latest efforts to suppress our civil liberties do not occur in a vacuum. For the past several months, personnel from the Department of Homeland Security, the FBI and the Secret Service have been on the ground in Chicago working to coordinate overall security measures for the NATO/G8 summits – and have made recommendations to municipal authorities on how to “enhance” these security measures. This occurs at a time when Obama has signed the National Defense Authorization Act and other repressive measures, and where strong evidence exists of a nationally coordinated, inter-city campaign to suppress the Occupy movement. The National Lawyers Guild and its legal partners have filed a series of Freedom of Information requests seeking evidence of this federal role in the Occupy crackdown, and they have painted an ugly picture of federal coordination at the highest levels to undermine the most basic precepts of our right to dissent. We “strongly suspect that the 72 so-called Fusion Centers created by the Homeland Security Department around the country, and the many Joint Terror Task Forces operated by the FBI in conjunction with local police in many cities, are serving as coordination points for the increasingly systematic attacks on the Occupy Movement,” writes the Guild . Inevitably, much of this will be litigated in the courts. Meanwhile, this latest effort by Mayor 1% and his yes-men and women – as well as his national federal partners – will not deter the legitimate right of the rest of us to speak our minds, raise our grievances and protest government policy, whether or not new “rules” give the police another excuse to try to censor us. We may not have won on Wednesday, but every single person who spoke out, showed up, shot off an email or phoned their alderman has joined a growing groundswell of truly grassroots opposition to the abuse of power. And that is very, very powerful. The 1% can make new rules. We honor a higher law and more fundamental freedoms: the human right to equality, dignity and peace with justice, the human right to challenge those who rip us off, undercut our health and safety and abuse our basic freedoms, and the human right to defend these freedoms with words and deeds. 1. We defeated the increased penalties for “resisting arrest,” but Chicago’s onerous interpretation of what constitutes “resisting” remains, overly penalizing many forms of non-violent civil disobedience. The penalties remain a minimum fine of $25 and a maximum of $500. 4. The “reformed” version of the legislation is thus only a slightly less obvious 1st Amendment restriction and begs the question, will parade organizers be required to ban “unauthorized” banners under threat of fine and/or jail time? Speaking at the City Council’s Committee on Special Events, Cultural Affairs and Recreation meeting on Tuesday, Michelle T. Boone, the Commissioner of the Department of Cultural affairs and Special Events, tried to soft-pedal this provision by implying that there would be no penalty for violation of it. But if that’s so, why include the provision in the ordinance at all? 5. By changing the definition of what constitutes a “large parade,” the new ordinance slips in onerous insurance and other burdens on demonstration organizers. Unless one gets a financial waiver from the Commissioner of Transportation, every street march in the downtown area will require $1 million liability insurance and “indemnify the city against any additional or uncovered third party claims against the city arising out of or caused by the parade; and (3) agree to reimburse the city for any damage to the public way or to city property arising out of or caused by the parade.” Failure to provide proof of insurance with one’s permit application will be grounds for rejection of the application. There is no definition as to what constitutes “reasonable proof acceptable to the commissioner.” Moreover, both the old and new versions of the ordinances allow the Transportation Commissioner to “establish…rules and regulations” in addition to those specified in the legislation – i.e., a virtual blank check to institute unpopular measures that might have difficulty passing the City Council. When a member of the public raised concern about this during a City Council committee meeting, Boone tried to allay the concern by noting that the language had been lifted wholesale from the old ordinance and that “they [the police] don’t enforce a lot of it.” The reality is that there has been very selective enforcement of this provision of the old ordinance, amounting to a 1st Amendment content-based restriction. By making the public assembly provisions a new subsection of the Municipal Code, the City will either enforce the old provisions against everyone, or continue its selective enforcement. Either result is a serious retreat away from the 1st Amendment. 8. The deputizing of police authority, perhaps even to private security outfits, remained intact in the legislation as passed. There is no sun-set clause on this provision. 9. The only “temporary” ordinance concerns the issuance of no-bid contracts. It is important to make sure that this truly goes away on July 30th as provided for in the legislation as passed. a) The approximately half-dozen aldermen in the Committee on Special Events, etc. apparently had the latest version of the parade permits ordinance when they passed it out of committee on Tuesday afternoon. It was announced that paper copies of it would be distributed to them at the start of that meeting. When one of us asked for a show of hands during public comment section as to who had read it, all six or so claimed they had. The fact remains, though, that the “latest” versions of the legislation that the City Clerk’s office gave us 90 minutes before the Council vote on Wednesday were outdated, and as of yesterday, the Clerk’s website still only had the old versions. So there was no way the general public had access to what was being voted on and thus have the opportunity to meaningfully weigh in on them. b) As noted above, there is only one item in the whole body of legislation that has a sunset clause. This legislation then was not just for G8/NATO, as Emanuel claimed. In a January 17 City Council committee meeting, Mike Simon of the CDOT said that the permits ordinance revisions had been in the works since 2009. As one of us said to Tunney after the committee meeting, they’ve had this under review for two years and they’ve apparently talked to all players except those who actually use the ordinance. c) The January 12th not-for-attribution press briefing (with no paper copies of what the revisions were) was accepted with virtually no criticism by the City Hall beat press crew. This was as much a statement about them as it was about Emanuel. Right up to and after Wednesday’s vote, most accepted City Hall’s spin that there were dramatic concessions to our side in the revised legislation. d) Next up in the transparency department – what are the G8/NATO summits going to cost city taxpayers? Mayor 1% said that “We’ll make sure that taxpayers don’t take on the bill” and in a Council committee meeting, Alderman Pope falsely claimed that “Historically host cities have been wholly reimbursed.” But wholesale violations of protesters’ rights by police have typically cost host cities millions in civil suits after the fact. Win, lose, or somewhere in between? Finally, there is the issue of whether or not to call what happened on Wednesday a “victory” for our side or not. Most (but not all) mainstream media accounts accepted the 5th floor’s spin that Mayor 1% had listened to the people and revised the legislation to address our concerns – a victory for protesters. We obviously don’t think so, but at the same time, it would be wrong to label what happened as a wholesale defeat. It is standard operating procedure for the City is to introduce draconian measures to the CTA, etc. in so-called “doomsday” budgets, only to then walk back the cuts to more “acceptable” levels once there is public outcry – the “acceptable” levels being the ones they planned on instituting all along. But we don’t think that this was the initial plan for this legislation – “professional protesters” (their term) are not a group in the chain of power that they think merits any concessions. We think that they introduced the legislation in the form that they wanted it to pass, and were taken aback at the level of resistance our side was able to muster. There was no advance plan for the January 12th Mayoral dog-and-pony shows. Those and the other spin measures were crafted in response to our resistance, and the City had to deliver at least minimal concessions in order to make them credible. If we had not fought, we would not have won anything. Aside from the teachers and those fighting the health clinic cuts, we were the first group to take the new mayor on in a sustained battle. And we’re really not a group at all – many thousands of people who did not know each other united in opposition to the mayor’s plans. As with any new administration, there are always those in the public who hope that the new guy will be better than the old one, that he can be reasoned with, etc. This was an uphill battle on those grounds alone. 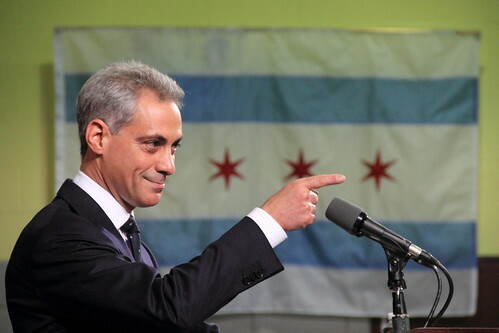 Our sustained battle over the ordinances helped take Emanuel’s credibility down at least a few notches, concretizing his reputation as Mayor 1%. Moreover, we sent the message that if the City messes with us, we will fight back tenaciously. Given the rubber stamp nature of our City Council (reinforced by Emanuel’s deep pockets, etc. ), the idea that anyone could defeat him first time out was a total long-shot. Thanks to this struggle, the odds of people defeating him on other issues in the future have gotten at least a little bit better. * * * * * * * * * * * * * * * * Previous articles in this series can be found here, here, here and here.